The final volume in Martin Gilbert and Randolph Churchill’s collaborative–and unparalleled biography–of the finest statesman of the 20th century, Never Despair covers the last twenty years of Winston Churchill’s life. 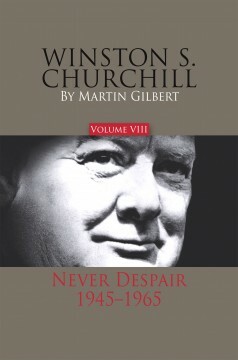 Volume 8 concludes this multivolume biography, begun by Churchill’s son Randolph in 1962 and finished here by scholar Martin Gilbert. Martin Gilbert was born in England in 1936. He is a graduate of Oxford University. In 1962 he began work as one of Randolph Churchill’s research assistants, and in 1968, after Randolph Churchill’s death, he became the official biographer of Winston Churchill. Since then he has published six volumes of the Churchill biography, and has edited twelve volumes of Churchill documents. As a distinguished fellow at Hillsdale College, he is currently completing the Churchill document volumes. During forty-eight years of research and writing, Gilbert has published eighty books.